Comet ISON: Will Potential 'Comet of the Century' Get Brighter? From now through October, comet ISON tracks through the constellations Gemini, Cancer and Leo as it falls toward the sun. Image released March 29, 2013. Comet ISON has brightened little, if at all, since the start of 2013, and when last seen was hovering at magnitude 15.5, making it nearly 4,000 times too dim to be seen with the unaided eye. To readily observe the dim, fuzzy blob of ISON prior to June 22, you would have needed a very dark sky and a telescope with at least 20 inches (50.8 centimeters) of aperture, if not more. Comet ISON is too close to the bright twilight, but that will change after the first week of August as ISON — then a morning object — begins a slow emergence into the morning sky. Both amateur and professional astronomers will have their fingers crossed that by early August ISON will have shown significant brightening since it was last seen in late June. Mercury will be passing 4 degrees south of the comet on Aug. 8 and might be used to steer an observer toward ISON. But, by then, the comet will still be rather faint — probably about magnitude 13, although it might reach to magnitude 11 or even 10 by the end of August. Astronomers use a number-based magnitude scale to determine the brightness of objects in the night sky. The lower the magnitude number, the brighter the object. With Comet ISON's brightness apparently stalled as it disappeared into the glare of the sun, it's anybody's guess just how bright the object will shine when it reappears in early August. The unpredictability of how bright a new comet may appear or how bright it ultimately gets is no surprise to those who constantly study these enigmatic objects. There are many variables that go into determining what ultimately will be seen: the comet's orbit; the relative positions of the sun, Earth and comet; and, of course, the size and composition of the icy chunk of material that forms the comet's nucleus. One reason it's so hard to predict a comet's brightness is that the material expelled from the object's nucleus usually comes in distinct, albeit non-uniform jets or emissions. From more than a century's worth of observations, astronomers have developed general formulas and models for comet brightness based on the observed behavior of literally hundreds of comets. But some comets, like people, have their individual quirks. 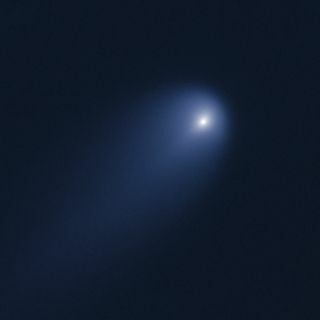 It is hypothesized that ISON appeared abnormally bright during its discovery by amateur astronomers in September 2012 because it possessed a thin "frosting" of volatile material that vaporized at a great distance from the heat of the sun. This may have initially given a false impression that the object was dynamically large and active. After the frosting evaporated, the comet stopped brightening. As to what happens next, observers now must wait until the comet gets close enough to the sun for any frozen water locked within its 3-mile-wide nucleus to begin to sublimate (go from a solid to a gaseous state). This, in turn, could "kick start" ISON back on a brightening trend. ISON will need to come to within 230 million to 280 million miles (370 million to 450 million kilometers) of the sun for this to happen, but the comet won't arrive within this distance range until July 8 to Aug. 12. By the latter date, ISON will have emerged into a dark sky and will again be assessable to observers, low in the east-northeast sky, just before the break of dawn. Will it have brightened or will it still be "stuck?" Observers will just have to wait and see.